First off: What is Darkfall? Darkfall is an online, [You must be registered and logged in to see this link.] where members take on the roles of [You must be registered and logged in to see this link.] characters that explore the island of Darkfall and collect loot, bounties and priceless artifacts. Our roleplay posts resemble segments of a story rather than one sentence responses. It also uses a gameplay mechanic similar to the Pokemon Mystery Dungeon games, led by Seekers, or more commonly known as Dungeon Masters. We use Pokémon, Pokémon gijinkas and Pokémon hybrids (or morphs) as characters, and follow them as they seek to become the best Guild on the island. While we have created our own universe, we do use the Pokemon games and our sister site, Epidemic Johto, as the primary source to help maintain quality and canon. Please note that we are an elite roleplay forum and that we expect high quality storytelling and writing from our members! Each member is required to have an avatar. This avatar must come from the list of images we provide in our [You must be registered and logged in to see this link.]. To use an image, simply right-click on it and copy and paste the URL, or save the image to your computer and upload it. Please note that legendary avatars are reserved for staff only. Blood and gore is allowed. Only vague reference to heavy illegal substances allowed. Multiple accounts are not permitted. One account per member. Explicit sexual content is not permitted. [You must be registered and logged in to see this link.] is not allowed. Embedded videos are not to be posted anywhere in the main forums. Freedom Corner is okay. There should be no talk of religion, politics, or other controversial issues in the out-of-character forums or the chatbox. Each member has a PM box, which can be found in the top menu under "Messages." It turns red when you have a new private message. Only you and anyone else who is involved in the PM can see the message. Respect is required both in the public forums and chatbox, as well as private messages. If there are any issues that occur between members, please contact an administrator or moderator to resolve the situation. There should be no spamming or trolling. Please respect others and do not attack anyone or use inflammatory behavior. 3 verbal warnings = a chatban (can be less based on severity). First chat report: 3 day chatban. Second chat report: 1 week chatban. Third chat report: Permanent banning from the chat. Any violation of these rules will result in getting banned. Can have text, banners, sprites, and links that link to your characters or your Shop/Sketchbook. Your signature should be NO MORE than 200px tall. Banners are allowed to be put in signatures. Banners should be no more than 150 px tall and 500 px wide at maximum and DF related. They are allowed to be smaller than 500x150 px, and animated if smaller. Banners are to be DF or EJ exclusive; they should not link to outside sites, to prevent viruses from entering DF. 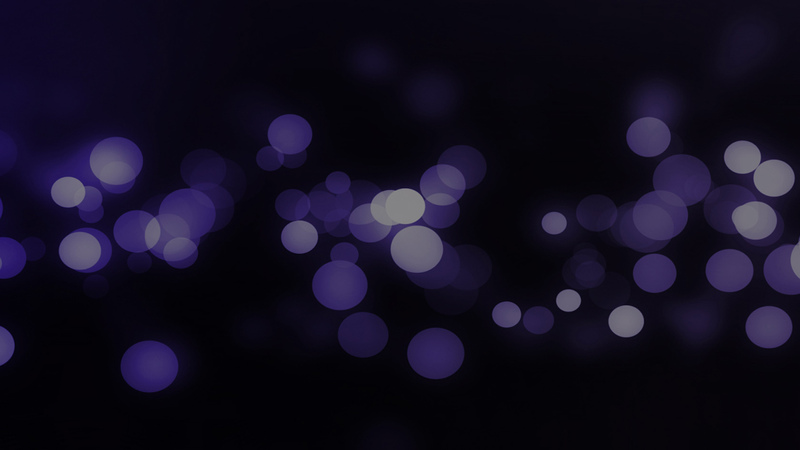 Here is Suicune's banner, which links to his profile, as an example. There is a slot in everybody's profile sheets for a character sheet. A character sheet is a mandatory thread created in the [You must be registered and logged in to see this link.] 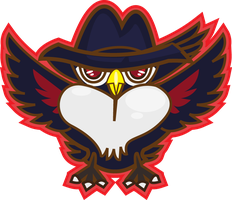 sub-forum, and it is to contain all of your characters and their respective team sheets, profile links, and rp team links. If you go to the Profile tab at the top of the forums, you will see an area where you can edit certain elements of your profile. Once you create a character sheet, you can link it in your profile by editing the appropriate area titled "Character Sheets". This link will also show up right under your avatar. It is recommended that you use BBCoding to give a title to your character sheet (a tutorial for BBCoding can be found [You must be registered and logged in to see this link.] if you need assistance; use the 'Linking to other sources in text/image' section) to make it look neater and a little less ugly. 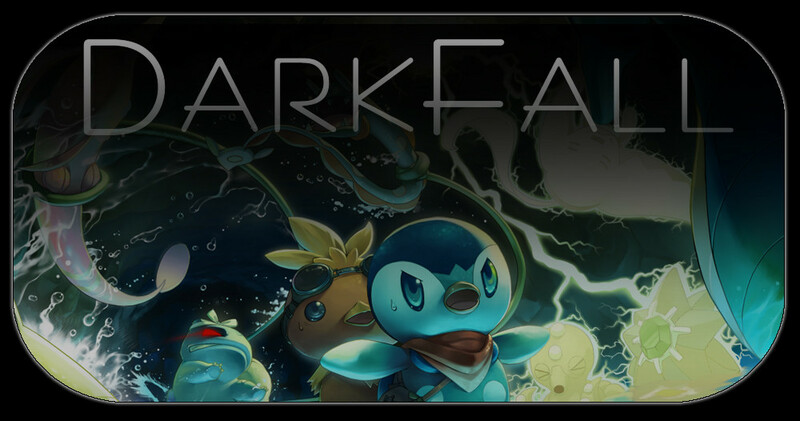 The characters of Darkfall consist of various species of Pokémon, and the roleplay itself consists of the stories that tell of their exploration. Making a character that is truly your own is encouraged, but there are some guidelines that must be followed. All Pokémon species are allowed, except for legendaries. Pokémon are allowed to have their Dream World Abilites at the use of a Mutator Ticket. Shiny and oddly-colored Pokémon will only be accepted with a shiny character ticket. A shiny ticket is required for shiny Pokémon or Pokémon that have different coloration on more than 25% of their bodies. Characters should not be overpowered. Every member receives two living character tickets when they first join. These tickets are given to you blank when you first begin. When a character is submitted by the member to the Profile Computer, it may be approved by an admin (Mewtwo), and a character ticket will be filled out with your character's name. These tickets can be found in your profile page, so you can keep track of how many tickets you own. Tickets can be traded between members and purchased by going to the Poké Mart. You are permitted to kill off your characters in order to be refunded a character ticket. However, please note that if you character is killed by an Omen, no ticket will be refunded. You must post on your team character sheet if you kill one of your characters so we can refund your ticket and take you off the team roster. You cannot kill another member's character unless both parties explicitly agree. Conversations dealing with killing off another member's character should be dealt with through private messages. No bullying other members to kill their characters if they decline. Such behavior is not acceptable, and if you are found down such the consequences will consist of your character tickets getting stripped and/or a potential banning. Darkfall is a 'turn-based' roleplay, meaning that everyone in each thread must post in an established cycle to ensure no one gets left behind. In addition this this key rule, there are some other guidelines that should be followed while roleplaying on the forum. The characters/players are listed in the order they should post in in the team character sheet of the team that particular character is a member of. Characters are only to follow the character preceding them, and are not to post out of turn unless the character they normally follow has been listed as away. It is recommended that each player posts once a day to keep the team's rp flowing at a steady pace, but they should wait no longer than three days to respond. Please post at least a paragraph each time you respond, but try to avoid going over seven paragraphs if possible. Make sure you use proper grammar! A [You must be registered and logged in to see this link.] is available if it is needed. All new members will be screened for grammatical/writing skill. If your writing is not at the level needed to effectively tell a story, you will not be allowed to post in the official RP. Use out of character (OoC) notes where applicable. They are granted permission to harm or kill another member's character. When they give permission for another member to harm or kill their character. Every official RP thread is member-moderated concerning content. If a member sees violations of forum rules (be it godmodding, one-sentence posts, or otherwise), they are to notify the member. If the violations persist, it will be reported to one of the admins. At the top of each post, provided a centered image of your character. You can do this by using the bbcode [*center][*img][*/img][*/center]. Following the image, state your location and time of day in bold. Do not change the font size of the text. Resizing of text will be fixed by a moderator or admin. Any color changes you include in your post must be easily readable. In Darkfall, a "guild" is made up of the other characters your character will be interacting with. The guild you choose to place your character in will essentially become your roleplaying "group," and any and all canon roleplaying will take place in their thread. Each member's character will be assigned to a guild. A full team consists of five individual members. It will start with one Seeker, and will grow until it reaches its limit. A team can only be created when all the other RP teams are full. Guilds that are open and available to join can be found in the Guilds section. The Seeker will determine where the team's journey will start. They will determine what happens during quests and dungeons and provide any stats that are necessary for each member. Please note that there are strict activity rules on Darkfall to ensure that threads do not become stagnant. A character/member is given three days to post, starting at the moment the team member before them posts, which begins their turn. A warning will be posted in the Ill Omens thread in the Hub for members who haven't posted by the third day. On the fourth day, if the member hasn't posted by 1200hrs (approx. US Mountain time), the character will be killed by Omens. What if my timezone is not set to US Mountain Time? Please note that the times are based off of Darkfall's forum time, which everyone's should be set to Mountain Time, also listed as Denver, Edmonton UTC 07:00 in Preferences. If your timezone is not set to the correct timezone, go to your Profile > Preferences Tab. At the bottom, there should be a drop down menu of the timezones. Simply find Denver, Edmonton UTC 07:00 and click on it, save, and your time will match the rest of the forum's. The reason that the timezone should be set to US Mountain Time is to keep things simple and organized. All of the warnings will be synchronized to be posted at that timezone, including the time you must post by. Approximately ten minutes are allotted after the death warrant has been reached (due to time differences), but no longer than within that timeframe are you allowed to post. Do not chance going over the forum time, as your characters' lives may be at stake. If your character(s) do(es) get killed by harbingers, your character ticket is forfeited. You will not get it refunded. If two of your characters are killed by omens, you will be barred from playing in the official RP. Omen attacks can be taken off your profile after two months have passed without any further attacks on your characters if you post in the Omen Recalls Thread. This is true even if you are barred from the official roleplay. The omens devour any slacking posters, therefore it is essential that you protect yourself from them by posting when it is your turn. If you are not going to be able to log on in order to do so, however, there are ways to avoid an omen attack. If you plan on taking a leave of absence, notify the safehouse managers. Throughout Darkfall, we have numerous sections that allow open RP. This means that there is no turn by turn structure, and is in fact open for anyone to jump in or out of RP at any time. Open RP is in real time, so it should coincide with the site AM or PM. If your character is in one open RP, it cannot be in another open or closed RP at the same time. Your character can only be in one place at once. Guilds are teams of one Seeker and five other characters that explore various location and dungeons for loot and adventure. Seekers must always be present with a guild when adventuring, for your own safety. They carry and manage the backpack and are your resident dungeon masters. This means that they create scenarios, enemies and npcs throughout the life of the quest. Seekers will find a job and lead the team, and either participate or merely observe by their choice. If the entire team faints out in the wilds, the Seeker will teleport them back to their dorm where they must rest for one day and decide on a new course of action. Jobs are to be decided on by the Seeker, as they are the ones creating it. They can discuss beforehand with the group what kind of job they wish to take on. Seekers can only decide to participate or spectate before a quest begins, and not during. If spectating, Seekers may roleplay actively, but may not battle with their character. Seekers must do their best to be active on the site while a quest is ongoing. Before taking a leave of absence, they must first either finish the quest or request a replacement Seeker. Each Guild will own their own sub-forum or dorm, where all the Guilds' activities will happen. This includes various open and closed roleplay, bunks/chests, team backpack, history and team sheet. Be sure to pay close attention to each section, as they will have individual rules set up for them. Bunks are where characters can customize their own bunk image and where they store their items. After your Seeker creates your bunk, you can create what your ideal room looks like and request your image be changed any time. The next post will be created by your Seeker as well, which will serve as your chest. This is where your items can be held, where they will be safe. Chests have infinite slots, and can hold anything. The chest will only be editable by your Seeker. If you wish to sell or use any items, you have to request for them to be placed in the Team Backpack. The backpack holds all your items. Like in the Mystery Dungeon games, if your team faints outside of the town, you not only lose all your items, but all your currency as well. Be wary of how much you keep in your backpack and only carry what you need. Everything else can be stored in your personal chest and in the town Bank. If you wish to sell any items, they must first be in your backpack. Campfires may be made each night, to not only keep your team warm in colder climates, but to cook raw food. Upon starting, characters may not have weapons. However, we have provided a blacksmith, where you may craft your own weapons with the appropriate items. In order to get the items necessary, a character may buy or quest for the ingredients. Time and Weather passes by real-time, which means that the time on the forum is the time of day (or night) in open RP. When in closed RP, weather and time of day may vary based on what your Seeker dictates. In weather-neutral biomes, the site weather is to be minded, which can be found on the left side of the site. However, some biomes have their own weather, such as the desert or the mountains. As our rules are a bit lengthy and complex, we do not expect you to read through and understand everything in one day. You are free to PM the admins or talk to members in the chat if you need any help. We made these rules to keep the forum at its highest quality possible. Once you make your first character and jump in, it gets much easier from there. Your next step after accepting the terms is to go to either the [You must be registered and logged in to see this link.] in order to create your first character. Alternatively, if any new members are interested in pre-existing profiles, they should take a look at the [You must be registered and logged in to see this link.]. In this board you may adopt abandoned characters that may be in need of a good owner. I humbly accept the rules. I accept these rules and conditions. I happily accept these terms. I graciously accept these regulations.